If you create a template of a character that uses a Master Controller, by default, the Master Controller's script file will not be copied over in the template. The same goes for any other file the Master Controller could depend on, such as an interpolation grid. Hence, the Master Controller will not work when the character template is imported in another scene. To circumvent this, you must specify the master controller's script file and its dependencies in the Extra Files property of the Master Controller node. NOTEFiles to include with a Master Controller template must be located inside the scene directory, or in one of its sub-directories, in order for Harmony to be able to copy them with the template. How to specify files and folders to copy when creating a template that contains a Master Controller. In the Node view, click on the yellow square of the Master Controller node to open its Layer Properties. Select the Extra Files tab. Next to the Files to copy field, click on the Function button to create a pseudo-function in which to store file and folder names. Click on the Function button again to open the Files to copy dialog. If all of your Master Controller's files are within one sub-directory of your scene, type the name of that sub-directory. For example, if you stored all the files for your Master Controller in the scripts sub-directory of your scene, type script. 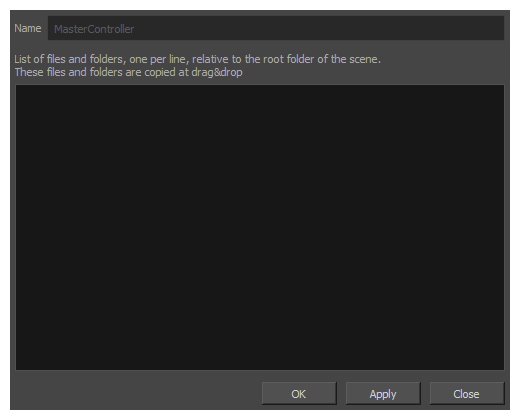 Type in the path to each file your Master Controller depends on, relative to the scene directory. For example, if your Master Controller uses the file myScript.js in the scripts sub-directory of your scene, type scripts/myScript.js. You can type one file path per line. If you create a template that include the Master Controller node, the files listed in the Extra Files parameter will be copied in the template's directory.